From the Publisher: Welcome to Hope Beach. A place of intoxicating beauty... where trouble hits with the force of a hurricane. Inheriting a beautiful old hotel on the Outer Banks could be a dream come true for Libby. The inn cries out for her restorer's talent and love of history. She's delighted to learn of the family she never knew she had. And the handsome Coast Guard lieutenant she's met there on the island could definitely be the man of her dreams. But Libby soon realizes that the only way she can afford the upkeep on the inn is to sell it to developers who are stalking the island. The father who willed her the inn has died before she could meet him, and her newfound brother and sister are convinced she's there to steal their birthright. Worst of all, her best friend and business partner has been kidnapped before her eyes, and Libby's under suspicion for the crime. Libby's dream come true is becoming a nightmare. Her only option is to find her friend and prove her innocence or lose everything on the shores of Hope Island. My Thoughts: The last Colleen Coble book I read was Blue Moon Promise, which I loved. Going into reading this book my expectations were high. Tidewater Inn, a present day novel, was a good read. When I say that I mean that it was pretty easy to read, follow the story and you didn't have to think too hard. There were several things in the plot line that I figured out towards the beginning of the book, but in example of Coble's writing abilities there were still a few twists I didn't see coming, which is always a welcome surprise. Even though I figured out where one or two things were headed the overall plot of the book was new and interesting. There were many characters in this book, which at first was a little distracting, but after you read farther you began to straighten them out. Some characters I liked, some I disliked, which happens in many books that you read. I enjoyed Libby's journey to discovering family, navigating a possible new relationship, and diving deeper into her belief in God and what that means for her life. Would I Recommend This Book? Yes. It wasn't one of my favorites, but I did enjoy it. The end resolved itself in a satisfying way. I read the book in about a week, it was perfect for bedtime reading. While a couple characters annoyed me, there were other good characters, really good characters, and story lines to make up for it. If you like books with mystery and a little bit of romance thrown in, than Colleen Coble's Tidewater Inn is worth checking out! 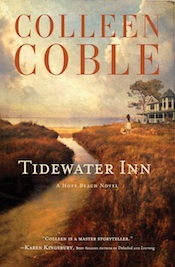 Check out the blog tour for Colleen Coble's Tidewater Inn.